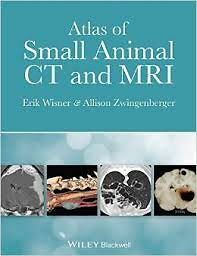 Atlas of Small Animal CT & MRI is a highly illustrated guide to the common clinical disorders of dogs and cats that are now routinely diagnosed using computed tomography and magnetic resonance imaging. This invaluable new resource features a wealth of high-quality CT and MRI images and includes relevant radiographic, ultrasonographic, endoscopic, and gross pathology images, offering a unique approach emphasizing comparative imaging and pathologic correlation. The book is organized by anatomical region with subsections focusing on specific anatomical sites or disorders—from the head, neck, brain and spine to the thorax, abdomen, and musculoskeletal system. The accompanying text emphasizes important imaging features focusing on what is important to the diagnosis of disease. Where helpful to the imaging diagnosis, information related to disease etiopathology, non-imaging diagnostic procedures, and treatment is also included. Essential for specialists in training and qualified specialists in the fields of small animal veterinary diagnostic imaging, internal medicine, and surgery. Also of interest to those in general veterinary practice who commonly refer patients for CT and MRI examinations.